If you haven't seen any of Ken Block's insanely popular "gymkhana" videos on YouTube, go search for 'em. As of this writing there were four full official videos, with surely more to come, and they are crazy awesome. The sport of gymkhana is all about exercising an incredible level of car control through difficult, often small courses. It's not like regular racing where the object is just to get to the finish line first. In gymkhana, you want to execute the most awesome-looking stunts you can, as perfectly as you can. Ken Block's style takes the sport to a new level of insanity, and Hot Wheels now brings us a way to (hopefully) tap into that insanity with an RC car. This car looks great from the outside and is a pretty close replica of Ken Block's famous purpose-built high-powered Ford Fiesta. Unlike the real car, though, the Hot Wheels RC version isn't all-wheel drive. In fact, it isn't even two wheel drive. It's one wheel drive! As you'll see in the video, there's a fifth, large wheel right in the center of the car, viewable only from the underside, that actually delivers power to the ground, and is also responsible for most of the steering. It turns at a very sharp angle opposite the direction you want the car to go. It's a very interesting design concept, using an idea I have previously investigated in the hobby-grade RC drifting field. It could work well in theory, but it could also be a total disaster in real life. Right from the start, controlling the Hot Wheels RC Ken Block Gymkhana car takes some getting used to. Though it has a pistol grip style controller, forward & backward motion actually comes from pushing the steering wheel up & down, respectively. You then twist it while pushing or pulling it to make the car steer. I probably found this more awkward than most folks will because I'm so used to the the two "standard" styles of controllers. Moving past that bit of awkwardness, this car gets really fun, really fast. The way it moves is unlike anything I've ever driven before. It's not powerful enough to truly drift, but it looks like it's drifting all of the time. 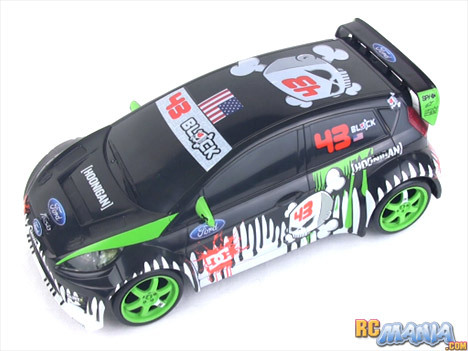 Unlike with actual drift cars, the Hot Wheels Ken Block car can be easily transitioned from turning one way to the other exactly when & where you want it to. It's almost like you're cheating. The car allows you to immediately do things that normally require a significant amount of practice and skill. Where there would have been a throttle "trigger" on a normal controller, this one has just a big, flat button. When you squeeze it, the car goes into a much tighter turn. This lets you do full 180 fishtail maneuvers, or you can even get it to go into a very tight donut spin. By varying your use of this button and watching how the car responds when you go from turning one direction to the other, you can gain better & better control amd make your moves more precise. In other words, even though the car makes things easy and you don't need practice to do well with it, you can still buil up better skill and abilities the more you use it. The one thing that did get in the way of enjoying the car to its fullest was an occasional cut-off of control. that neither myself or my colleague who helped a lot with the testing & filming could figure out. Sometimes the car would just stop moving in the middle of being driven around. It seemed to happen more outside than inside, and we didn't notice any pattern to when it would do it. The Hot Wheels RC Ken Block Gymkhana stunt car is definitely a blast to drive. They tried something completely new & different with the functional design, and it worked. There are two things working together to keep this one from earning an A rating from me -- price & battery requirements. The two AA cells you need for the controller will last a long time. However, the six that go in the car can get eaten up pretty quickly (I won't give an exact time as it will vary dramatically depending upon what brand of batteries you're using and how you're driving). If you use regular alkalines, that'll get expensive. I recommend having at least two sets of rechargeable batteries ready (12 pieces total) to help keep the fun rolling for a kid who really enjoys the car. Note: This review was not sanctioned by Mattel or any vendor. I bought the production car at full price at a store and evaluated it from a completely unbiased perspective.